Three different topics in one blog post. "The game must be fun to play"
I've been looking at tabletop publisher submission guidelines and often see some form of this ridiculous statement: "Game must be fun to play"
Why is this ridiculous? Because how enjoyable a game is depends so much on the preferences of the target market that there's no such thing as a "fun game", period. I don't use the word fun at all, because I think fun comes from the people you play with, and the circumstances, and that's how people can have fun playing a dire game like Monopoly, or even a super-serious game like chess. Lots of people enjoy playing chess, but half of them wouldn't call it fun (yes, I've asked chess players). Look at the movie reviews at Metacritic.com and you'll see how two people can have entirely opposite views of whether a movie is good. 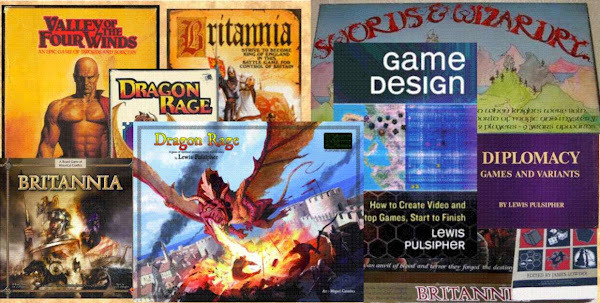 With more genres, more variety, games are even more subject to variable opinions. So to say "fun game" is so personal that it's no guide to a designer who may want to submit a prototype. Occasionally I'll write to the publisher who's done the "fun thing" and try to get them to explain what they like. Sometimes it's hard to pin them down, sometimes not. They all know (or think they know) what they think a fun game is, but do they consciously know? I am rarely in a game shop, both because they're scarce and because I live "out in the country". I recently went to one for a game designers' guild meeting, and took time to look at what was on offer (other than comic books). First, I saw lots of boxes, large and small, containing miniatures, including games using miniatures. Star Wars X-Wing, War Machine, War Hammer, and others. A 2 inch tank was discounted to $11.51! To me, never in sympathy with miniatures prices at the best of times, the prices were breathtaking. But that means big profits for the shop. It also showed how much game shops are driven by hit games, hardly a surprise. I also saw lots of CCGs and accessories, also providing great profit margins to the shop. More than half the square footage of the shop was devoted to game playing space. I was told that on Wednesdays, boardgame night, the place was full, which would be 50 people I'd guess. The Thursday I was there, with no formal organization, there were 10 in the game area. My experience is a little different in Gainesville, Fl, where there's one boardgame shop, and another I haven't visited that is comics and so forth (and Magic) and not much in the way of boardgames. There are game events every evening (7 days a week) at this shop. But what dominates the shop's revenue is Magic: the Gathering, and many of the events are Magic tournaments or casual play. Not surprising about Magic, it is much more than half the CCG category, and CCGs are much more than half the tabletop game category, in the US (by revenue). Magic is about a third of the whole. I can record a hockey or basketball game and watch it a day (or two) later; as long as I haven't heard the score, it's just as "real" as at the time it was actually played. Many people absolutely don't understand how I can do this. It's because I have an imagination, and because I'm not wedded to Instant Gratification. But also, I don't rely on social media for my enjoyment of the game; I have other things to do during a game, if I'm not going to just watch it. I always hated ABC for those NASL soccer games interrupted by commercials. Not the interruption, but the fact that they didn't tape delay so that you saw the entire game. Instead they'd come back occasionally and say "while you were away a goal was scored" and show the replay. DUMB! I didn't care if it wasn't quite "live", I did care not to be told what happened "before" it happened! Life in general isn't a matter of what's new, it's a matter of what's new to you at the time. Yes, the hockey game is "old news" to some, but to me it's new at the time. The game Stratego is new to someone first playing it even though it's been around for more than 70 years, and its nearly-identical predecessor (L' Attaque) has been around for more than a hundred. The whole notion of “innovative mechanic” or “innovative game” is so wrapped up with what players have known before, as to be mostly-useless.